- Lift the brake plate out of the hub. There will be a lot of brake dust, so gloves are advised. - Lift up on opposite sides of the shoes so they pivot off the posts. Be prepared to chase the springs. - Hold the shoes side-by-side, like a closed bear trap, postion the ends on the posts. The end of the shoes with the rounded notch go with the round post, the end with the flat surfaces goes with the brake lever post. - Fold the shoes down like opening a bear trap. Be prepared for things to slip around and for the springs to come off in one or more places. - Fiddle with the way the ends of the shoes fit on the posts. One end needs to be inside the recesses in the post and the other end needs to be on the flat part of the brake lever post. - If the shoes bind when you try to fit them back into the hub, note the shiny spots on the shoes where they rub the hub, then use a flat file to take off some of the braks material. I'm guessing it should all take no more than a half hour. .......- Lift up on opposite sides of the shoes so they pivot off the posts. Be prepared to chase the springs. 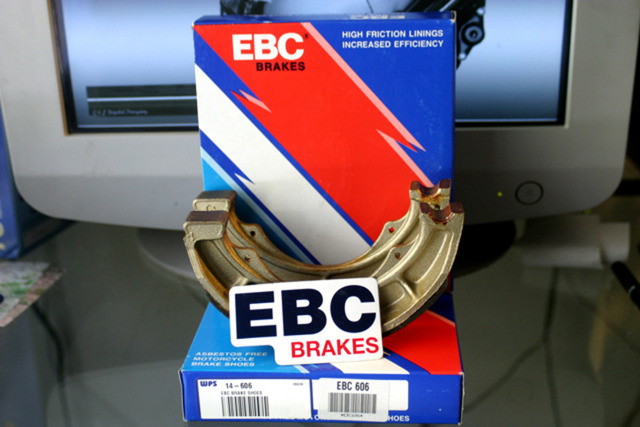 I had my brake shoes off a while back to clean things up, and, although it was easy to get to them, the steps that I quoted above were giving me a problem. I could not figure out how to do it. I even made a special tool to help which worked good, but was not nearly as quick as "the trick." 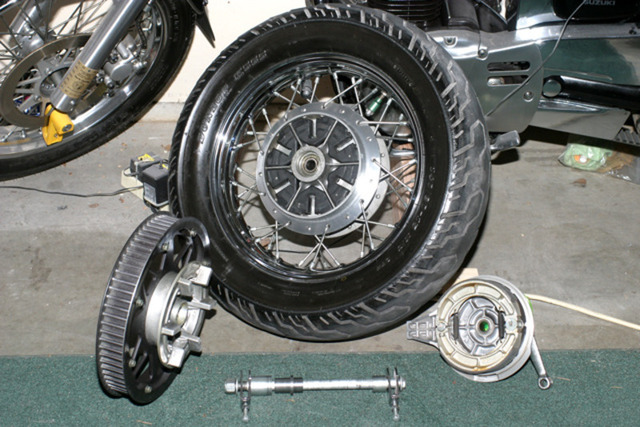 I only have 11,000 miles on my bike but I have to really push down on the rear brake pedal for it to respond.Where is the rear brake drum adjuster located? On the rear drum.....on the end of the cable that pulls on the brake lever. Move the nut farther in on the cable. It's not like the old star adjusters on a car. Like Dave said, follow the brake cable to the back of the bike. The adjusting nut at the end of the cable will allow you to take out some of the slack and hopefully get your brakes working correctly. If you find that you are at the end of adjustment, you can loosen the 10mm pinch bolt on the actuator arm and rotate it clockwise one position. Where should the actuator arm be positioned on the cam for NEW shoes? Where should the "SPLIT" be located in relation to the "INDICATOR" mark on the cam? -The silence of indifference makes cowards of men. I actually installed them short side facing out and it seemed to work much better. When I put it in short the thing pully had a lot of play and would jerk to one side when I started it and the wheel would wobble a lot. It still wobbles, just a little. The problem is mine does't look like that, it had a bevelled edge on one side.